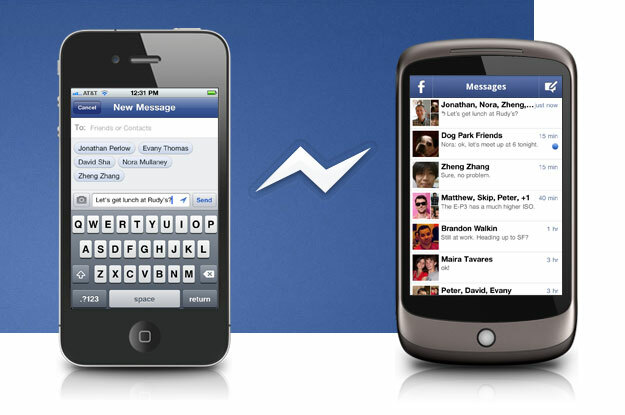 On Tuesday, Facebook launched its second official mobile app, dubbed Facebook Messenger. The free app, which is made for iOS and Android devices, allows users to chat and send messages instantly over Wi-Fi, 3G and 4G connections, or via SMS text message. Less than 24 hours after its release, some already claim that it stands as a major competitor to BlackBerry Messenger, Apple’s soon-to-launch iMessage, and even standard SMS texting services. Here, I’ll take you through a hands-on walkthrough of Facebook Messenger to help us all get a better handle on what Facebook Messenger is — and which services it may or may not smother. 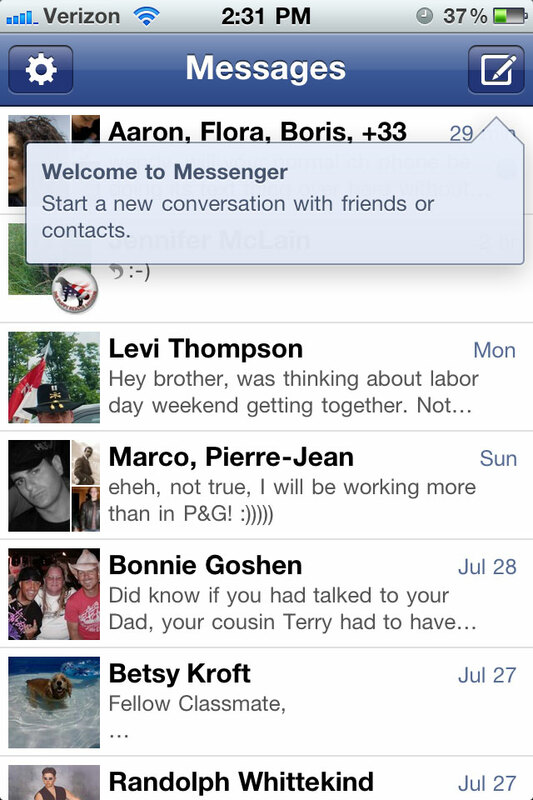 Of course, anyone who wants to use Facebook Messenger must first have a Facebook account. 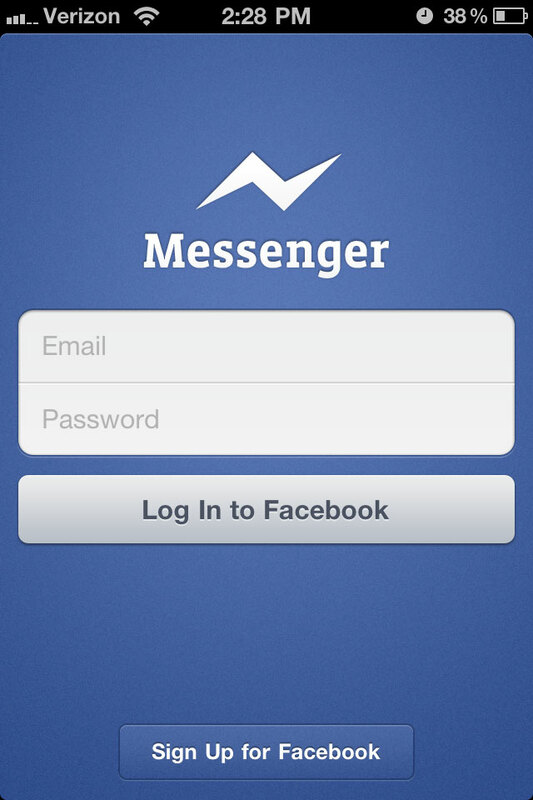 If, miraculously, you aren’t already on Facebook, Messenger allows you to sign up directly from the start screen. Registration is actually done through the phone’s mobile browser, which opens automatically when you click the sign-up button. The process is straightforward; only name, date of birth, gender and password are required. Once finished, the app sends you confirmation messages via SMS texts. Just re-open the app, enter your info, and you’re ready to roll. Anyone who already has a Facebook account, all 750 million of you, can simply enter their credentials and log in, just as you would on Facebook.com. 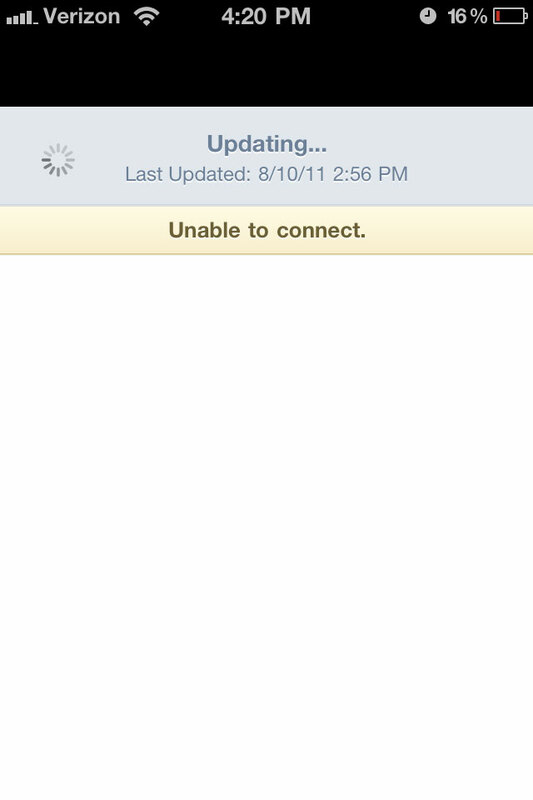 All of this is standard fare that will come naturally to anyone who’s ever used a mobile app that requires logging in. After logging in, you’re taken to a home screen that shows all your previous conversations from both Facebook Chat and Facebook Messages. Unread messages are indicated by a blue dot on the right side of the message, which shows the name of the people in the conversation, as well as a short preview of what the message contains. The home screen also include a new message icon in the top right corner, and a settings icon in the top left. The home screen has all the functionality you would hope, but since it’s just a list of conversations, it might feel a bit odd to people who expect more of a dashboard page, with icons for each function, as is the case with the standard Facebook app. I had this reaction at first, but I quickly grew used to the look and feel of Messenger. As on Facebook, you simply click on a message, and it will open up a dialog box that shows all the previous messages in that thread. To reply, just tap the text box at the bottom. To send a new message, tap the icon in the top right corner, which resembles a pen and pad of paper. Click the “To:” field to add contacts. As with Facebook friend search, as well as mentions in wall posts and messages, typing the first letter of a contact’s name brings up a list of relevant friends from both your Facebook friends list, as well as you device’s address book. Contacts for whom you have a mobile number are indicated by a small phone icon next to their name and photo. Messages sent to people with a mobile number available, but without the mobile app installed, will receive the messages via SMS text. They can respond to those messages by sending their reply via SMS, or through Facebook. After you’ve added all the people you wish to add, just tap the text field and enter your message. Tapping the small arrow in the right corner of the text field turns on and off location sharing. 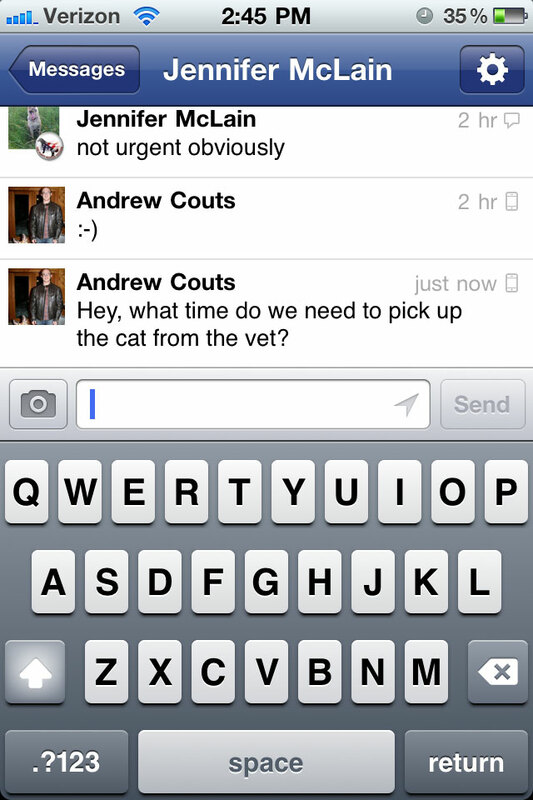 Messenger also allows you to send photos in your messages, much as you would send an MMS message. A prompt screen allows you to either take a new photo or choose one from your device’s photo album. Like the rest of this app, replying and sending new messages works exactly as we’d expect. The functions worked quickly and intuitively. No complaints here. Facebook Messenger has two types of settings: universal settings, which change how the app behaves overall, and conversation settings, which only apply to each individual message. To change the universal settings, just click the gear-shaped icon in the top left corner of the home screen, which pulls up the settings page. 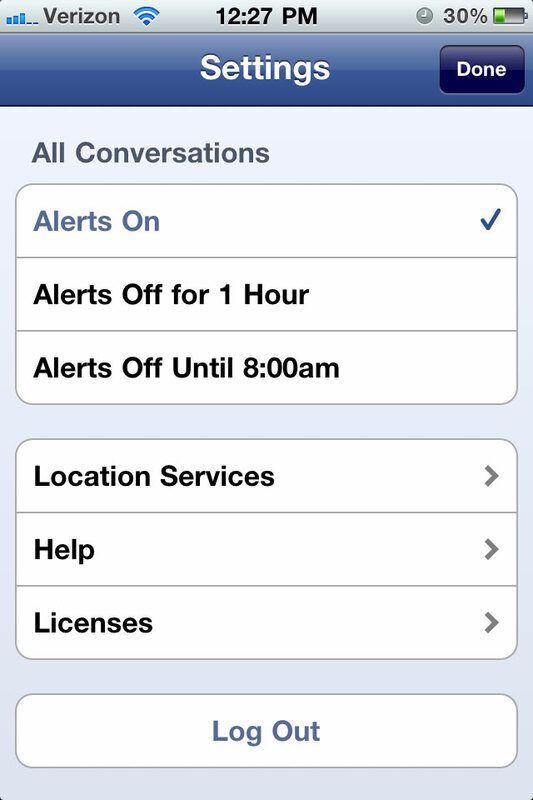 From here, you can set Messenger to alert you as soon as you get a message, or you can turn off alerts for one hour, or until 8 a.m. the next morning. This setting seems very odd to me. I can understand wanting to mute alerts, but the one hour and 8 a.m. restrictions seem peculiar and arbitrary. What if you want to mute alerts for three hours? What if it’s 7:30 a.m. now, or just turned 8 a.m. 15 minutes ago? It’s strangely restrictive. This feature would be far more useful if you could decide the exact length of time you’d like to mute alerts. The universal settings screen also includes Location Services, Help and Licenses tabs. Of these, only the Help tab seems particularly useful. Conversations settings can be accessed via the gear-shaped tab that appears in the top right corner when you’re in an individual conversation. 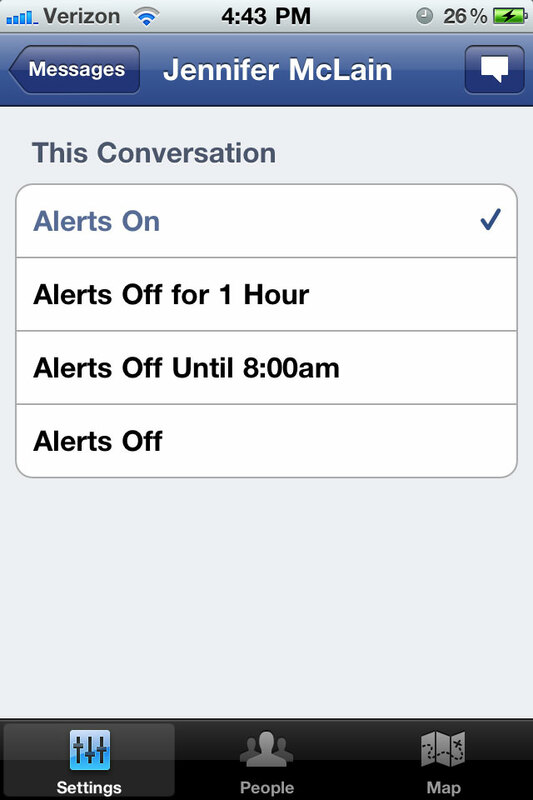 If you are only chatting with one person, the first conversation settings screen allows you to set your alert preferences, which includes muting that conversation for one hour, till the next morning, or you can just shut off alerts for that conversation altogether. When chatting with a group, you are also given the option to re-name the chat, which can make it easier to keep track of your various conversations. You can also choose to leave the conversation completely. At the bottom of the screen are two more settings tabs, one labeled “People,” and another labeled “Map.” People allows you to edit who’s receiving the messages by either adding or deleting contacts. The Map opens an integrated Google Maps window, which automatically shows you where every text was sent, provided the sender had location sharing turned on. I’ve said my piece about the alert muting feature — it needs work — but the People and Map functionalities seem genuinely useful. Everybody’s wanted to add another person into the loop on a conversation, and seeing where people are messaging you from can help in all types of scenarios. Overall, these settings and features are the most well polished parts of the app. I have to preface this part by saying that, for the most part, the app worked seamlessly, and more or less as I would hope and expect it to work. But I did run into one major problem. The app “could not retrieve conversations” for more than an hour and a half and, therefore; I was unable to do anything with the app. It simply tried to load the conversations constantly, and was completely stuck on that screen. Eventually, after turning my phone (iPhone 4) off and on repeatedly, the app finally worked properly again, and hasn’t had the glitch again. Aside from that minor folly, I don’t really have much to complain about. Facebook Messenger delivers exactly the functionality you’d expect it to deliver. It works fairly seamlessly, and besides a little glitch, it performed excellently — save that obnoxious alert-muting business. In terms of whether this will kill BlackBerry Messenger or SMS texting, the answer is no. It won’t. At least, not by itself. (SMS will and should die a painful death as quickly as possible, but Messenger won’t deliver the death blow.) People who use those services will continue to use them, and they will likely use Facebook Messenger, too. The closest competitor will likely be Apple’s iMessage, once it’s released. But like BBM, that will have its place, as well. Given the group messaging capabilities, ease of use and practical functionality, Messenger will certainly have wide appeal. (In fact, it’s already the top free app on the iTunes App Store.) And if Facebook is the way you keep in touch most often, then Messenger is the new must-have app.